Ever wonder what the masses of folks on Twitter feel about something? About a new product release or a movie you where thinking about seeing? 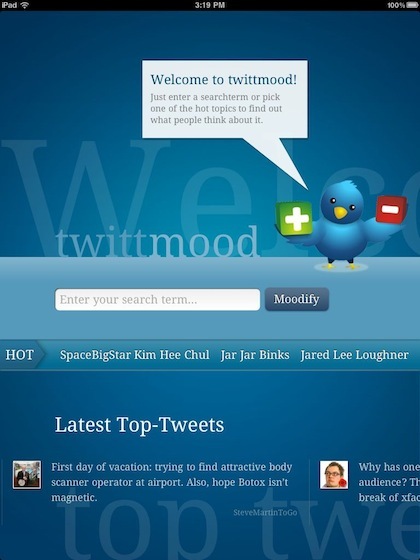 We have been working here on some rather extensive tools for the desktop, but was pleasantly surprised to see a ‘lite’ option from a developer for the iPad: TwittMood. Like the logo implies, the app shows you what are the positives and negatives being posted about you item of interest. The app launches with an overview of what is hot for posts right now which you can sweep through or enter text in the box about what your looking for more data on. Below we entered the word ‘iPhone’. 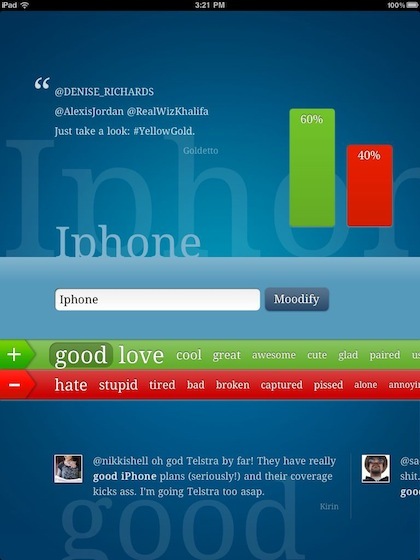 TwittMood shows us that there are 60% of the posts containing the word ‘iPhone’ are positive. You can sweep through the line of positive or negative words. 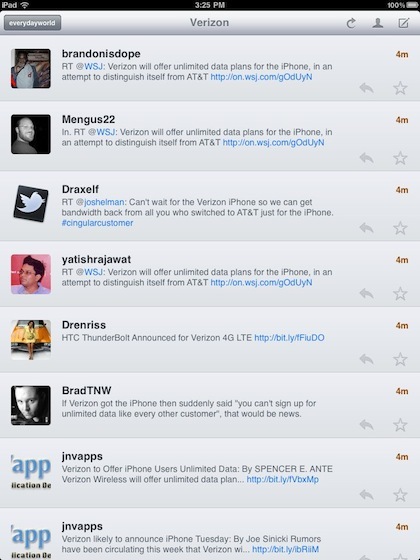 Tap on any word to see the posts from Twitter containing that word and your search word. You can sweep through those to see the particulars of each post. 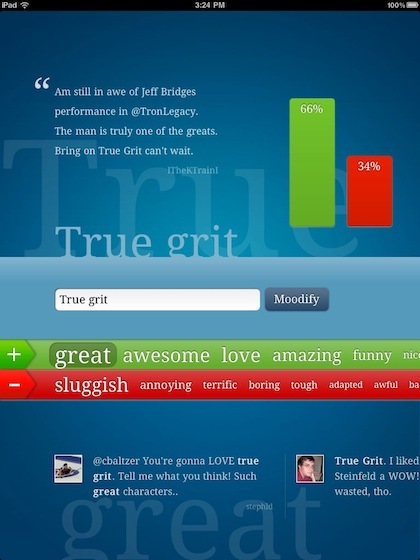 Thinking about seeing True Grit tonight, we checked to see if there was much talk about it. 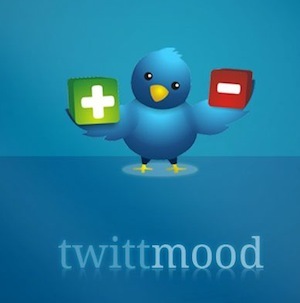 The TwitterMood app tells us that there are 66% positive comments about the movie. Glancing through the words, we didn’t see anything alarming. Careful what you search for, there may be more than one use of the word you have in your head. We searched for Griffin to see how people were reacting to all of their new hardware releases last week. 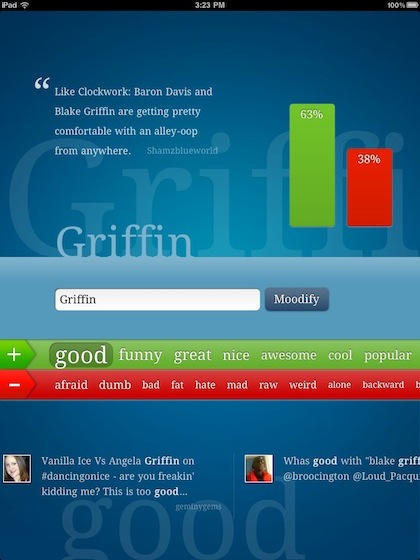 The TwittMood app has no way of knowing one ‘Griffin’ from another… here it showed the results of a person named Griffin getting a lot of Twitter chatter. Searching for Verizon resulted in the below response. We were surprised since there is a lot of talk on the Internet about the Verizon iPhone this week.